Need to know maker of this doll! We have a blond doll made completely out of cloth except for the face. I believe she is stuffed with sawdust making her appear almost solid. Her hair is able to be pulled back off the head almost like a wig only attached at the back with a small patch of hair just at the top for her bangs. All off her original cloths are on including the dress, undergarments, and a petticoat. Also her legs are held in with a metal pin so she can be moved to sit in the upright position. The bottom of her shoes are a thin card stock. If you can tell me anything about his doll I would really appreciate it. I'm trying to find out the year she was made and also who made her. Comments for Need to know maker of this doll! Yes,she is Polish. I have mine, and several others, and I was six, too when the story came out. 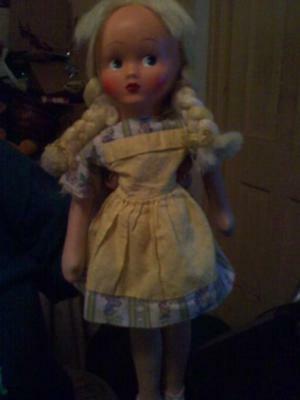 She, and all my other celluloid dolls have never caused me a problem. Very nice!! Hi. This doll was made in Poland. The face is celluloid. Often, they came in hair colored pink, orange, blue, red, etc. I have several, but some were from when I was six or so, and there was a problem with them. There was a safety alert issued because of the celluloid faces; parents were afraid they were too flammable. At the time, Ladybird Johnson had even purchased some, and she expressed her concern when the story hit the papers. She is a nice doll. It is a plastic molded face. Thanks you for your information hopefully it will help me find something out. Need to know maker of doll. Body is cloth but what is the head made out of? Molded cloth face or molded plastic face? Some had composition (wood paste fiber mixture)faces. Look on eBay under cloth dolls. Maybe you'll find one that looks very much like yours. Many of these dolls were made to represent different foreign countries. Join in and write your own page! It's easy to do. How? Simply click here to return to Bruckner Cloth Dolls.